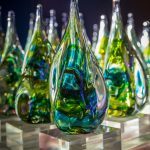 Awards, what are they all about? We are proud to be a small company with a big heart. But don’t let our size fool you. Being independent enables us to set our own rules and standards and we are super committed to providing world class walking experiences and proud to have been called pioneers in rural tourism. Awards inform us of our progress and indicate to you, just how seriously we take our hiking mission. Since Alison Howell’s Foot Trails began we have been honoured with awards and accolades for our achievements, and we continue to strive forwards. Here is a brief description of them and what they mean. We truly value all feedback, both constructive and praise, but particularly those words of our guests. Please read our latest reviews, over on our page on TripAdvisor. This year we have been awarded a 2018 Certificate of Excellence from Trip Advisor. From a record breaking 645 entries it was with immense pride that we received the Silver award in this category at a glittering black tie dinner in Torquay. We thoroughly enjoy welcoming guests from around the globe to experience our English Foot Trails and the award recognises our commitment to our international guests. 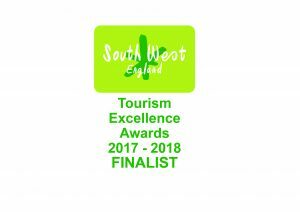 From a record breaking 645 entries we are thrilled to be announced finalists in these regional awards in the International Visitor Experience of the Year category. We will be proudly representing Bath and the South West in Torquay on 1st February 2018 when bronze, silver and gold winners will be revealed. 17 years ago green issues were uncommon. Anyone who spoke about them regarded as a hippy. Times have changed fortunately and being responsible is now regarded more seriously. We put ourselves forward early on for these awards, back in 2006 because we wanted to know how we were performing compared to everyone else as far as the environment was concerned. We were the first in Wiltshire to join and achieve a Silver award in 2006 and the first to gain a Gold in 2009. We have since been awarded gold three times and the prestigious Gold Star as an Activity provider for achieving the highest score in a gold grading. Foot Trails has introduced over 60 measures with a positive impact in that time. Our work continues. 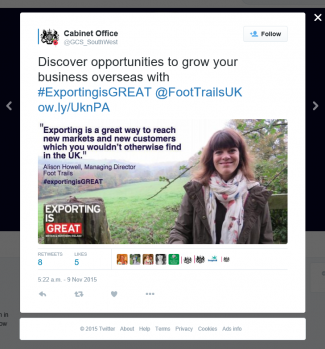 We were very proud to be selected to support the government launch of the new #ExportingisGREAT campaign. 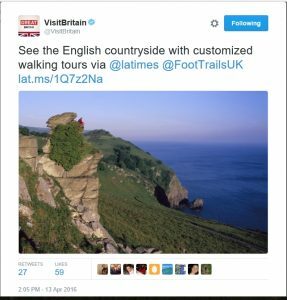 Visit Britain tweets about Foot Trails! What a great accolade. 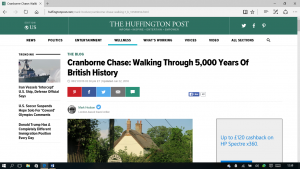 Visit Britain tweet about Foot Trails recent success with having an article published in the Los Angeles Times, USA! 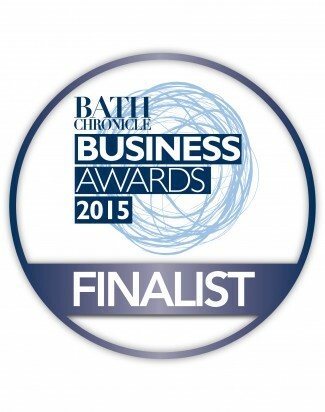 Alison Howell, our founder and CEO fought off fierce competition to reach the final three of the Bath Business Awards as Business Person of the Year for her work with Foot Trails. 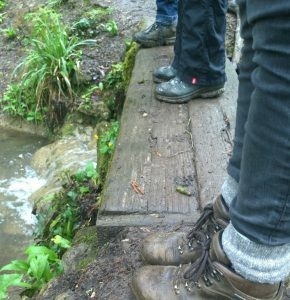 Foot Trails beat off stiff competition to be awarded one of only twenty scholarships available for UK businesses, awarded by the Department of International Trade, to win a scholarship to study “Working with Americans” and International business at Kellogg, the prestigious management school at North Western University, Chicago, USA. Founder Alison Howell spent 2 weeks in America and whilst at the school studied with some of the world’s leading professors, looking at USA economics, marketing, US law and developing professional relationships with Americans as well as culture. Foot Trails was immensely proud to be chosen as one of the 100 small business winners in the very first, inaugural Small Business Saturday campaign. A campaign in the UK to highlight the success and contribution to the economy and local communities small businesses make. 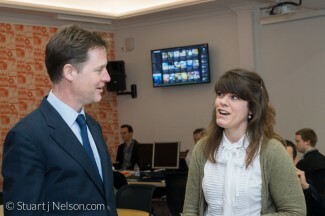 Foot Trails was invited to a reception in Downing street and involved in media campaigns on radio and press. 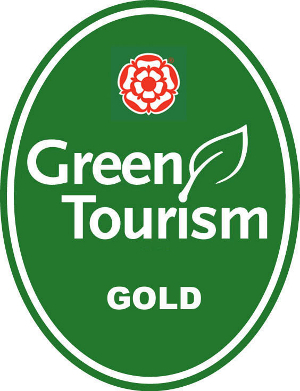 In November 2013 Foot Trails achieved one of the highest scores in a gold grading for an activity provider in the UK and Ireland and we were awarded the Goldstar award in Bristol by Earth Pilgrim Satish Kumar. 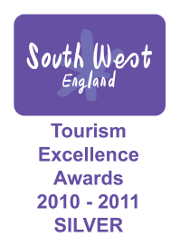 This was the second Tourism Excellence award we have received. 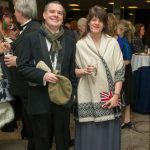 It is a great honour to be acknowledged by your industry peers and in this instance for our work on sustainable tourism with rural English communities. A glittering night when walking boots were exchanged for heels and were presented our award by TV journalist and broadcaster Declan Curry of Working Lunch. We all felt so proud (guests, the team, country inns and suppliers) to achieve this award and become the first UK travel company to be awarded the Big Tick for Rural Action. The award given to acknowledge our positive impact on rural communities and economies through tourism. Foot Trails reached the top 5 in the UK in this category. 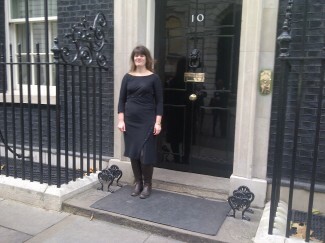 David and Alison were invited to 10 Downing Street and the Houses of Parliament Corporate Responsibility Select Committee to share good practice. 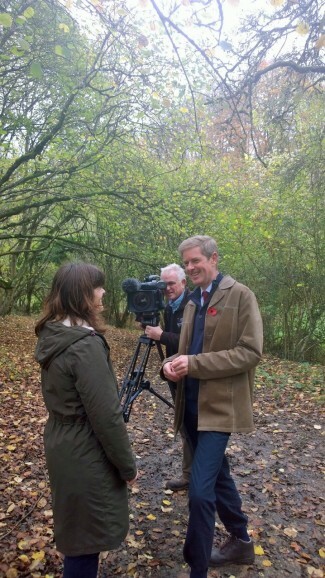 When Gill, then Editor of the Sunday Express announced the winner of the Tourism Experience of the Year in Gloucestershire, Alison and David were happy yet in shock! It was such a huge honour to receive this award from Foot Trails tourism industry peers, and to be named the best of hundreds of tourism businesses in south west England. It was a gre at honour for Alison to be named as one of the UK’s most enterprising rural Women. 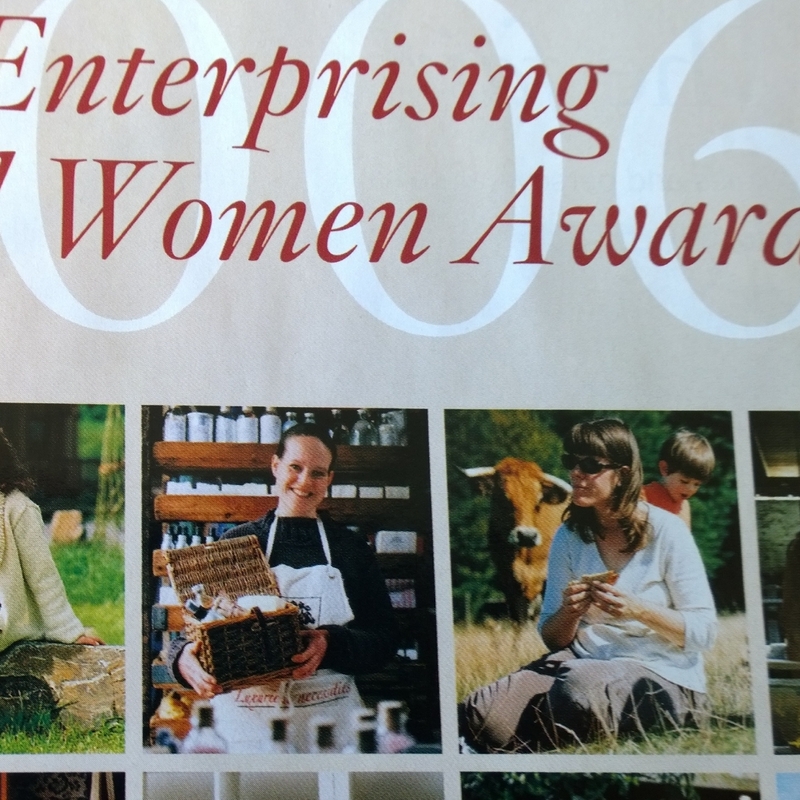 Meeting the other winners and finalists at Hampton Court, Alison commented that it felt wonderful to be part of a set of inspiring women who are working to change and grow rural business in England. And her award was presented by Country Living Editor Susy Smith.